The top leaders of the House and Senate veterans’ affairs committees are willing to cut funding for the Veterans Affairs Department in hopes of averting across-the-board cuts in federal spending. Now that you have read the article here is a directory to tell your Congressional Leadership how you feel. Some in Congress still oppose the change, but top Pentagon leaders have certified that it will not undermine the military’s ability to recruit or to fight wars. The Army was distributing a business-as-usual statement Tuesday saying simply, “The law is repealed,” and reminding soldiers to treat each other fairly. Making even incremental reductions to military benefits is typically a doomed political venture, given the public’s broad support for helping troops, the political potency of veterans groups and the fact that significant savings take years to appear. But the intense push in Congress this year to reduce the debt and the possibility that the Pentagon might have to begin trimming core programs like weapons procurement, research, training and construction have suddenly made retiree benefits vulnerable, military officials and experts say. President Obama pledges to help ‘the 9/11 generation’ of veterans. 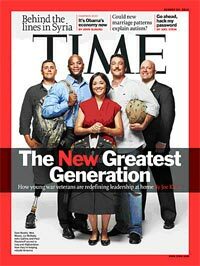 MINNEAPOLIS — President Barack Obama committed on Tuesday to taking care of what he called “the 9/11 generation,” vowing to spare Iraq and Afghanistan veterans’ health, education and employment training programs from Washington’s budget ax.